I seem to be taking a bit of a risk blogging tonight. We have crazy wind storms raging around us, shaking our house and flickering our lights. Actually, our power went out last night right after my post, so I was lucky to hit the Submit button when I did. We’ve had several power dips throughout the day already. That and my right shoulder is jacked up for whatever reason, so hanging out on the computer isn’t such a good idea (at least not for long). The power dips didn’t matter too much today because I was making Chinese dumplings. It’s something we eat every New Year (both western and Chinese new years). 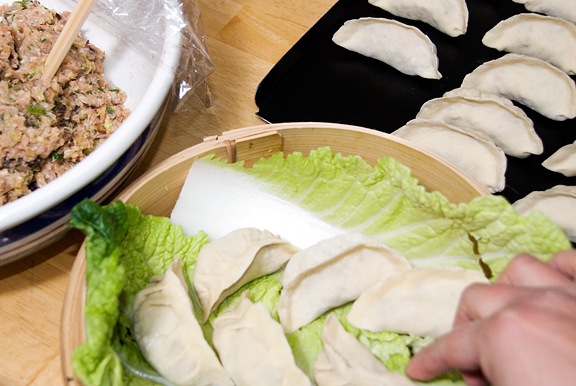 I made both the pork and shrimp fillings and cooked them into potstickers and steamed dumplings. I keep a list of recipes I want to try my hand at eventually. Then I have a list of foods I *really* want to try making, and it’s much shorter because it contains items that I either don’t have a recipe for or are really challenging to make. 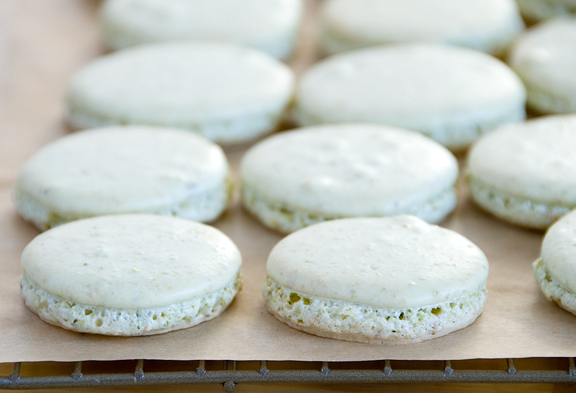 All last year, I had it in my head to make macarons – French macarons. They are finicky enough as it is, but toss in my elevation at 8500 feet and it’s enough to make any baker wonder if it’s worth tackling all at once. Well, it is. I made these just before the year was out! I’m not going to cover all of the ins and outs of making macarons because 1) I don’t know all of them and 2) there are far better resources than myself. I read up on Tartelette’s tutorial for making macarons (it’s the best one) as well as several of her gorgeous macaron posts on her blog. 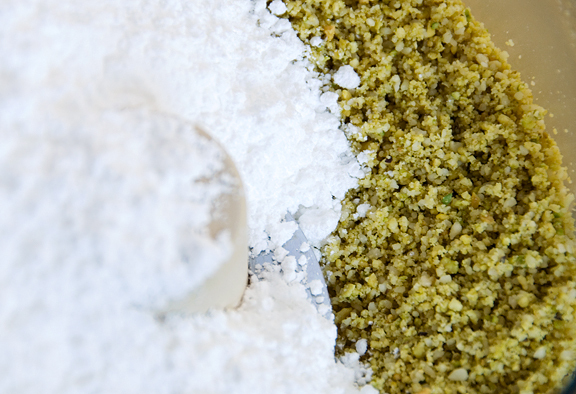 The flavor I wanted to make more than any other was pistachio, because I love green and I love pistachios – plain and simple. Lucky me that Tartelette had a recipe at the ready for me here. So Helen’s instructions call for powdered food coloring, which I don’t have anywhere in my house. She warned against adding liquid food coloring because it might disrupt the structure of the macaron batter. 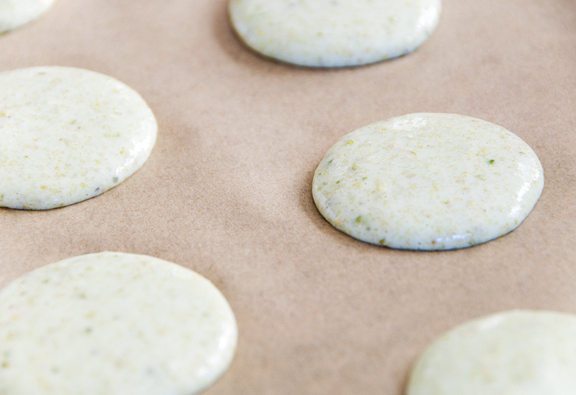 I wanted slightly tinted macarons (for some reason, I think it tastes more pistachio-ey if it’s green than if it’s off white – that’s just me… a child of the 70s), but was mortified that I might botch the whole job before even getting the batter to the piping bag. I tried a little trick I learned to color sugar for sugar cookies and added one drop of green food coloring and a drop of yellow food coloring to the granulated sugar and whisked it together until the sugar was the color I wanted. I let it sit for a few minutes and the sugar was dry, but green! 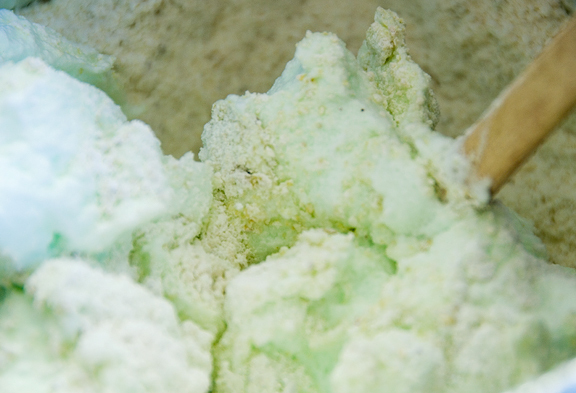 When I whipped the egg whites and added the colored sugar, it became a nice pale green color. I did read other instructions on making macarons, just because I like to gather as much information as possible before embarking on something totally unknown. 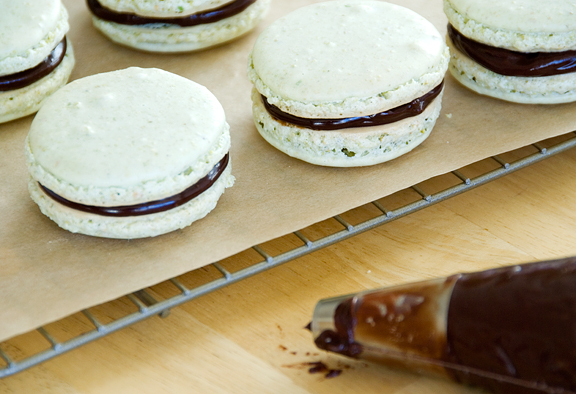 I had to laugh when several people declared the macaron batter should have a consistency of magma. Do any of these people know what the viscosity of magma is? I didn’t think so. Because magma is *subsurface* molten rock. Maybe they meant lava, but after making the macaron batter and having seen active lava flows, I don’t think they are similar. My first batch was probably a little on the runny side because my macarons were a little flatter and wider than I was shooting for. But letting them sit for 20 minutes before popping them into the oven gave them a nice firm shell which encouraged the development of “the foot”. I was so excited when I saw feet on my macarons through the oven door. who wouldn’t smile upon opening a box of these? 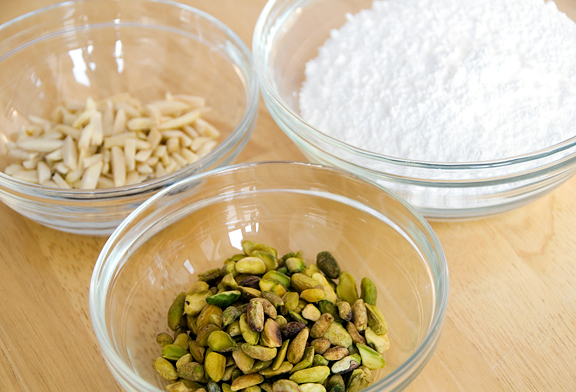 In a food processor, run the nuts and powdered sugar until the nuts are finely ground. Run through a sieve if needed. If using liquid food coloring, add a drop at a time to the granulated sugar and whisk together until evenly colored (your sugar will be darker than the final macaron). Set aside and let dry (a few minutes). Whip egg whites until foamy, slowly add the granulated sugar, until they are glossy. 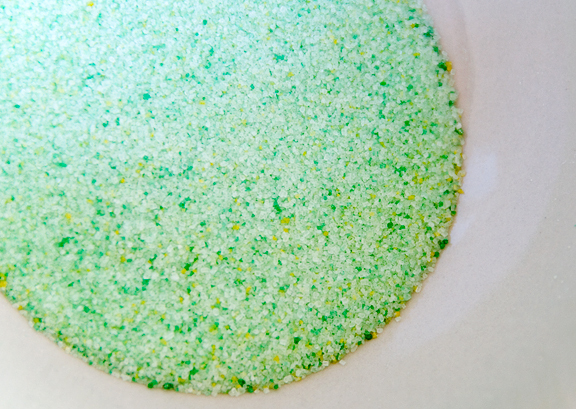 Add the powdered green food coloring if using. Slowly fold the nut/sugar mixture into the whites with a wide spatula. The mixture should remain shiny and flow easily (hold a ribbon for ten seconds, I would say). 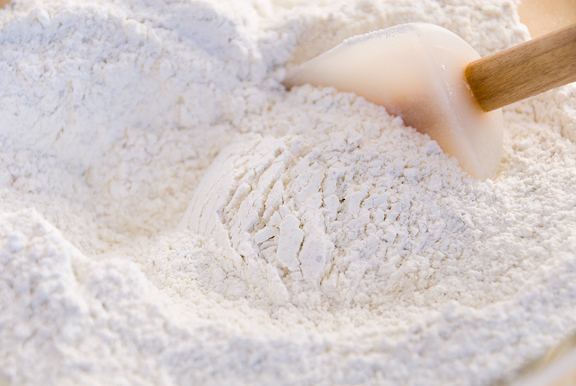 Fill a pastry bag with the batter and pipe small rounds onto parchment lined baking sheets. Let the macarons rest for 20 minutes. Preheat the oven to 315°F (325°F at 8500 feet) and when they are ready, bake them for 12-15 minutes (10 minutes, then reduce heat to 315°F for the last 3-5 minutes). Let cool, remove from the paper and fill with the ganache. Makes 35. Place the chocolate in a medium sized bowl. Set aside. Heat the cream in a medium sized saucepan over medium heat. Bring just to a boil. Immediately pour the boiling cream over the chocolate and allow to stand for 5 minutes. Add the butter and stir with a whisk until smooth. Stir in almond extract. Let cool to room temperature and use as desired. hmmmmm i will definitely smile wide and big if I receive a box of homemade macarons! so lovely! And you jsut reminded me to give this French treat a try! What perfect macarons! Really pretty and tempting! 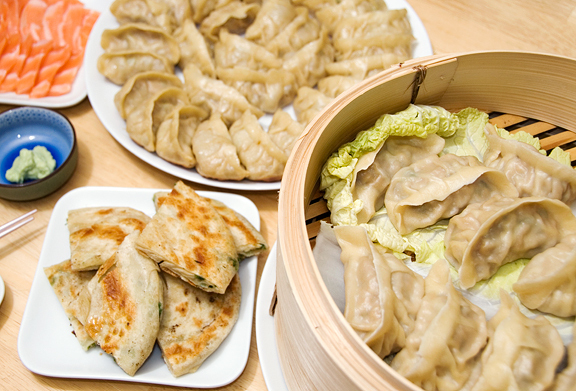 The dumplings look scrumptious too! Wow, those look really amazing! Yum! Those really do look like a great first attempt. I’ve had it in my head to make macarons too, but only because I keep hearing how challenging they are, and that makes me want to conquer them I guess. I actually made your dumpling dough a few days ago. Yeesh, rolling it out for dumplings was so much work. I haven’t cooked them yet. (They’re in the freezer.) When I do, I’ll report back on what I thought, but I’ll do it on the dumpling post from last year. Beautiful job! I think I sweat enough making these at sea level :P I really like that flavor combo too, and I agree – green makes pistachios taste more pistachio-y. Those look pretty darn good to me. These look so beautiful! I’m so impressed by your high altitude baking…I lived in Albuquerque for a summer and could barely get packaged brownies to turn out right! Amazing. We ate macarons everyday in Paris for a week straight. I’ve craved them ever since! This would be a great valentines day surprise for my husband, since we got engaged on our trip to France! ooooooooooohhhhhhhhhhhhhhhhh I love Chinese Dumplings! Do you guys make your own dough or are ya using pre made? I haven’t yet attempted to make my own, it looks tedious…..but I’m thinkin bout it! WOW those macarons look incredibly good. My one attempt at them was HORRIBLE and I don’t even have the elevation excuse to fall back on (and clearly, you didn’t need it!) Beautiful. You’re so fabulous. I think your first attempt is perfect — I don’t like them too tall, anyway. 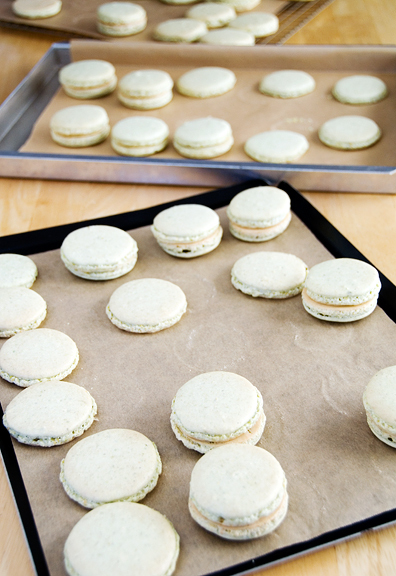 Macarons are on my “to make” list too … I’ll get there someday! OMG I was SOOO addicted to making macarons last year (since 2008 is now “last year”). I would wake up in the middle of the night with a new flavor idea in my head that I wanted to tackle. One you might enjoy?… black sesame. I find that it’s mostly the AZNs who enjoy that flavor. I made up a black sesame buttercream and they were FANTASTIC. Lemme know if you’re interested in the recipe ‘cuz I never blogged about that flavor. GREAT idea with the colored sugar. I bought some gel colorings but also don’t like using those much either. They’re just a notch above liquid. Sorry to ignore the sweets but DUMPLINGS! I love those so so much. And is that a scallion pancake? YUM. I am so overloaded on sugar that what jumped out at me were the fabulous dumplings! So that means I have to make successful Chinese dumplings on my first try, eh?!! Anybody would be lucky to get a box of these! I have happy memories of making dumplings with my mom & sister. Hi, I just found your blog the other day (looking for a roasted brussels sprouts recipe, which I made – YUM!) and I wanted to say Happy New Year and thanks for all the lovely recipes! I look forward to enjoying your blog even more this year. Best wishes for continued good health in 2009! Those are gorgeous! And I agree about the color/taste thing. :) Is it wrong tho that I’m craving the dumplings over the sweets in looking at this right now? Oh hell, give me both. I just tripped over your blog. I love it. From one Colorado Foodie to another. I love your content. The recipes are to die for and the photog is beautiful. My father is a surviving cancer member. What you are going through is tough but it appears that you have quite the spirit to beat this thing. We are behind you. They turned out beautiful jen! gorgeous photos as always! I’ve been afraid to approach the KA to attempt these little masterpieces. They intimidate me in more ways than one, but I see so many brave souls taking the plunge. I’ve just got to work up a bit more courage. Really. Really, I do. As always, beautiful in so many ways. Thanks for sharing and happiest of New Years to you and Jeremy and Miss K.
Aw, those would’ve been very popular here today! They look fabulous! But really I want some of those dumplings. These look like a very skillful and successful first attempt :) I have seen maracons around on a couple of blogs, but haven’t mustered up the courage to make them! But as a Christmas present I finally received some legitimate piping bags (I’ve been substituting Ziploc bags for years) and what better way to use them than French macarons? Your jiaozi look scrumptious as well – mine are always ugly and deformed haha. I agree with Kitt, Cookies good…Dumplings….better. 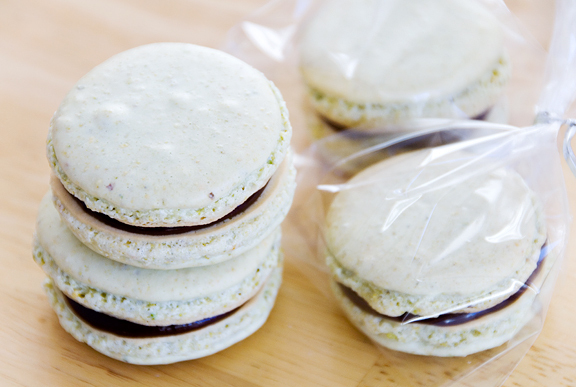 Those pistachio macarons look and sound great! Those are some great feet and smooth shells for a first attempt (if you hadn’t told us they were hollow we would never have known). That’s pretty funny about magma, just like there’s sound in space and the millenium started in 2000, people say the strangest things when it comes to math or science. I’ll trade you chocolate ones (for Jeremy since I gather he’s the chocoholic) for some of these. Happy 2009 Jen! All the best for you and your loved ones! My family LOVES potstickers so I decided I would give your recipe a try after the holiday sugarfest we had. They were amazing! I didn’t try making my own dough, but next time I definately will; this filling was just too good to put into store bought wraps! Thank you so much for sharing your amazing gift. Bravo to your sublime blog…it is always a pur pleasur to visit you !! Mrs E – thanks! Happy new year! Maja – happy new year to you! Once I tried my first macaron, I was hooked. They are amazing. Bridget – awesome that you made dumplings! It’s a lot of work, but totally worth it. 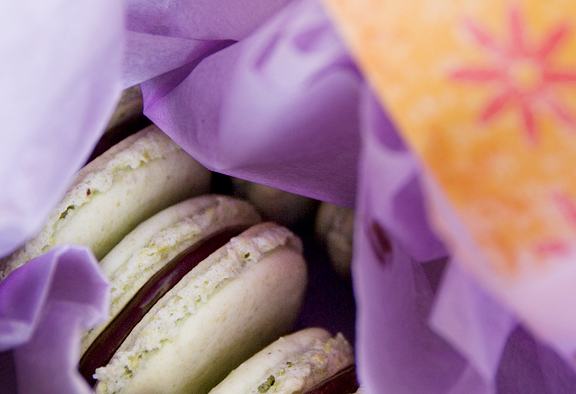 Amy – ha ha, I’m sure your macarons will be amazing – magma or no! Culinarywannabe – congrats on your engagement. What an awesome way to enjoy macarons – in PARIS!! Kathleen – I make my own dough. I’ve never bought dough before. You can click on the link in the post to get to how to make the dough. Cate – awww, try it again. I bet you’ll get it soon. Deb – *blush* girlfriend, you made my day. Holly – you can do it, hon! Lisa – ha ha, you’re one of those obsessive types? Once I get over my deadlines, I’ll be messing with flavor combos and other recipes. I’ve never been a huge fan of black sesame (although my sister was crazy for it). Sounds interesting though. You SHOULD blog it! Melissa – yup! Scallion pancakes. Delish! Karyn – thank you and welcome to URB. All the best for 2009. MODman – thank you so much. That’s very sweet of you. Glad to hear from another CO foodie. Margie – thanks. You just have to take the plunge and erase the fear. Kitt – hee hee, lots of dumpling fans out there! Chris – hurray! I hope you tackle the macarons with great success. Mark – I can’t believe how expensive your almonds are :( That will go on the list of things to send you, eh? Hilda – yes, it’s ridiculous the things people say based on science ;) I think pistachio is my favorite, but… I’m willing to experiment and find other favorites! Pomme – thank you so much. All the best for you and yours too! Tonyia – awww, that’s awesome! Glad you met with success. It’s a lot of work, but it isn’t too hard, right? Sonya – thank you. Happy new year to you. Oh, and I have bought an ice cream maker – can’t wait to try some of the wonderful ice cream recipes you have here! And now I’m craving potstickers! Gah! Patricia – oh, I wish they DID ship well – I’d send you a box for sure! I’ll bet you could crank these out easily enough – you are a very accomplished baker! Mmmm, ice cream. I hope you like the results! Emmy – ahh, good point. I rather like the flatter macarons too (having made a batch of chocolate ones that were a little too dome-ish for my liking). I’ve been a blog stalker for so long but finally have attempted one of your recipes. It took me awhile to get everything together but I made les macarons last night and half of the batch turned out wonderful! The other half of the batch got hollow and puffed up on top :( Also, I guess I let them cool too long on the parchment because when I peeled them off, I had left behind a small chunk of the middle! No worries though because I just put more ganache to “patch” it up. Love ya blog and Happy New Year! Lily – good for you! I’m impressed that you attempted the macarons. It took me almost two years to work up the courage :) Thank you and happy new year! genius, coloring the sugar before adding to the egg whites. I have been trying to see how I can add natural food coloring to the batch and most of the natural food coloring come in liquid form. The powder form is expensive and hard to find. I will try that trick. My first macaron attempt fell today but I’m motivated. Will keep trying. Do you think I could substitute peanuts for the pistachios and end up with a peanut butter shell? 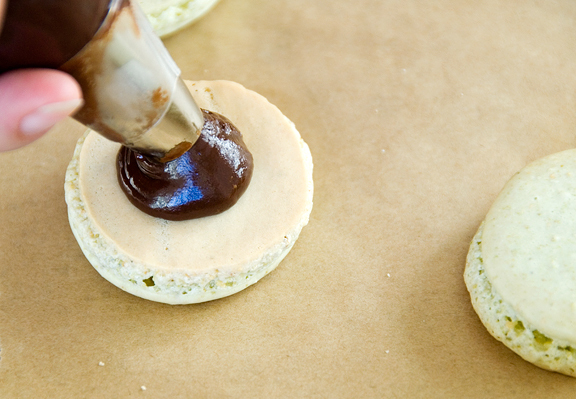 I’ve got the idea of pb+j macarons in my head and it won’t go away!